I have a backlog of FOs to document, and the only way to fix that problem is to just write about them, and quickly and efficiently as I can :). 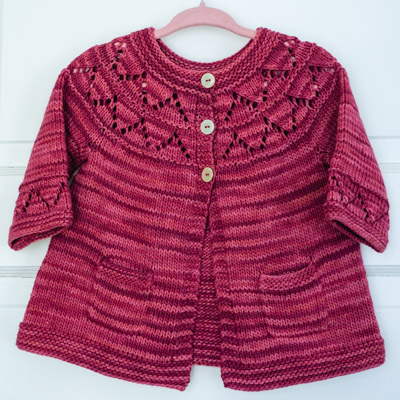 Pattern: Granny’s Favourite Cardigan, by Georgie Nicolson. 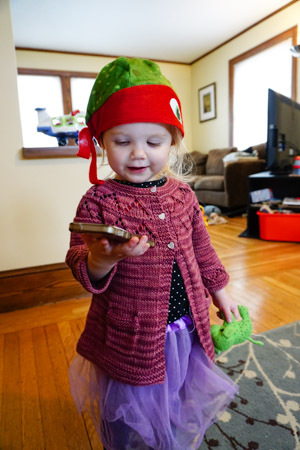 I knit the 21″ size, and it fits my 2 year, 5 month old nicely, but not for much longer. This pattern has been around for a while, and I just loved every FO I’ve seen so far, so it was time to give it a try. It’s a well-written pattern with many sizes, though I found some inconsistencies in the directions. For example, most of the time the “fit actual chest measurement” is used to denote the specific size, but some of the charts refer to the different sizes by age instead. For buttonholes, I used the “reinforced eyelet” from Montse Stanley, which is excellent, but I wish I had placed the buttonholes a little further in from the edge. The buttonholes opened up a bit with wear, and I eventually replaced the heart buttons I originally chose with slightly larger round buttons. Yarn: Araucania Ulmo 100% cotton, color #752, 2 skeins used almost in their entirety (about 380 yards). The two skeins were different enough that I needed to alternate skeins (as I’ve had to do when I used this yarn in the past). I played a little “yardage chicken” with this pattern, because I both wanted to add pockets, and make the sleeves as long as possible. This pattern is great for that kind of “fun” game because it’s knit from the top down! I originally thought I’d only have enough yarn for a short-sleeved sweater, so I’m pleased I was able to get almost full-length sleeves out of only 200 grams of yarn! Needles and Finished Dimensions: Using US 6 needles, my gauge was about 5.5 stitches per inch, 8 rows per inch. The sweater is: 23″ chest circumference, 5.5″ sleeve length to underarm (about 3/4 length sleeves), and 13.5″ shoulder to hem. Adorable! I like that it comes in lots of sizes too. Very cute – but I’ve always wanted ask about sweaters with only a few buttons at the top and the bottom is open. Is that very functional? You live in a colder climate – is it still warm if it’s half open? Does the open bottom get in the way (catch on corners and handles, flap in the breeze, etc.)? 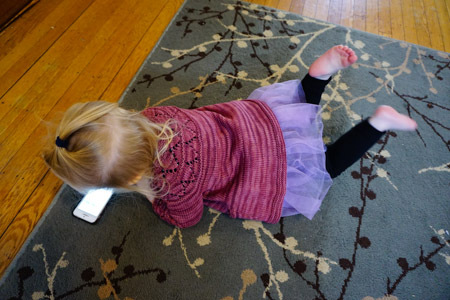 My first inclination is to put buttons all the way down – I’m interested in how this worked out, especially for an active 2 year old. 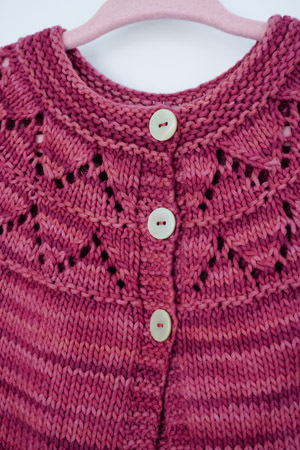 There is an adult sweater that is similar — Tappan Zee from Knitty.com. I made one several years ago; did a double take when I saw this children’s sweater. That’s adorable, as is your daughter! Nice work on both!